I think there are two types of people in this world: those who see things happen and those who make things happen. Do you agree? Read on and post a comment at the end of the article. Tell us which type you are. Sending invoices quickly is a critical component of managing cash flow and staying in business. You can be the very best at what you do, but you can’t keep your doors open if you don’t get paid. You may as well hand your business and customers over to your competitors. The incentive to write this article came to me the other day as I was going through my accounts payable and came across an invoice for recycling some electronic equipment. I was not familiar with the vendor, but since it was approved by a manager, it had to be paid. That's when I noticed the invoice was dated August 3, 2017. I thought, “Wait a minute—that was eight months ago! I'd better take a closer look at this one.” Then I saw that the date they picked up the equipment was 5/30/17, two months before the invoice date. They even set their payment terms at 21 days, making the due date 8/23/2017. I'm surprised they didn't add late fees. OK, so they dated their invoice two months after the services were completed, and then waited another eight months to send it. I've heard it said that some companies send their invoices before they’re due, some when due, some when overdue, and apparently some never do. Who knows? Maybe they had so much piled up on their desk it took eight months to find their invoices to mail them. This may be close to the truth, as we´ll see. And this is the really big one: they don’t know DocuSend can do it for them in less than two minutes. I have dedicated a good portion of my life to helping small businesses be successful, and sometimes I can’t keep myself from thinking: “These are people that had the temerity and intelligence to start a business. Do they actually want to fail?” Another thing I noticed is that our DocuSend SMB partners and users don’t have this problem. Far from it. But overwhelmingly, it appears our vendors do. You heard that right. The businesses I hire to supply and provide support for my own company seem to be shooting themselves in the foot. Not all of them, of course, but more than I care to think about. My personal and professional policy is to hire small businesses and local firms whenever possible. I don’t care if they’re self-employed or have 50 employees. If they’re local, reasonable, and reputable, I choose them over the big corporations and franchises every time. I think if small businesses don’t support each other, why should anyone else? But, all too often, small business owners and operators get swamped with important tasks to attend to, especially those that pile up near the end of the month—right when they planned to send out invoices. By now you get it—efficient invoicing practices are part of good cash flow management. Once you've delivered a product or service, don't wait to invoice. That can hurt your cash flow and your business. Waiting to bill for your hard-earned money intensifies the pressures placed on any business owner. You can alleviate that pressure by sending invoices immediately, on a daily basis, or as quickly as the nature of your services will allow. A product or service that has been completed is the closest thing your business has to cold, hard cash, and the sooner you invoice your client, the sooner you'll receive payment. How can the DocuSend cloud-based mailroom help your cash flow? Simple. It eliminates that expensive, painful, tedious, boring, time-consuming, monotonous, wearisome, hated task of manually printing and mailing invoices. It removes, eradicates, abolishes, rejects, exterminates, kills, destroys all of it. ✅ There are no minimum charges. It will cost the same unit price (80 cents for a one-page basic invoice) to send one as it will to print and mail 500. ✅ It takes two minutes to upload a file. No more printing, folding, stuffing and applying postage. Two minutes and you’re done. ✅ It works with any accounting software, and you can upload from your office or phone as soon as the job is done. ✅ It cuts in half the typical cost of sending invoices manually. You immediately begin saving 50% of your internal mailing expenses by spending a few minutes to upload a file. 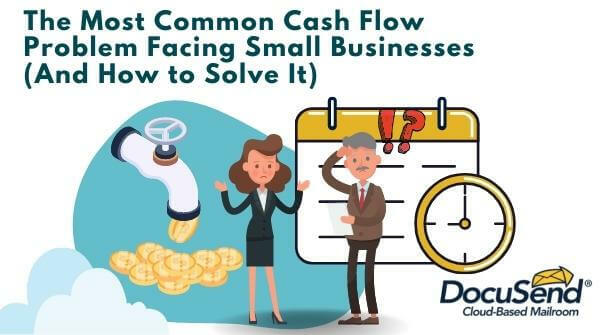 So, give it a try and put an end to the most common cash flow problem facing small businesses. One last thing, and I’ve said this before. When a company sends me an invoice months after the service is performed or the product is received, I can’t help but wonder how efficient the vendor I am dealing with really is. Maybe everyone doesn’t feel that way, but why take a chance? Thanks for reading the article, and please share your wisdom and experience by posting your comments below. It helps small businesses more than you might think. *mailomg.com People trust mail over digital.